I have been in the process of creating a series of prayer flags focusing on what is perhaps the most universal emotion of all...love. I had selected a series of quotations from a variety of writers and poets, and even several 'saints'. I had printed them off for my use as I was going about the process of using my bits and pieces of fabrics, and trims to create this series. As I was working on my prayers flags and watching a local news program, the photos of the Boston Marathon bombings came suddenly onto the screen. I immediately said a prayer for all of the runners and all of their families, and friends. But,I could not help but note the significance of my being in the process of creating a prayer flag, just at the very moment of the explosions. All of the ripples of the aftermath of emotions hit me all at once. To see something like this event, which has always been so positive and uplifting, suddenly exploding into something filled with fear, anger, loss, and pain...seemed incredibly sad, yet incredibly meaningful at the same time. 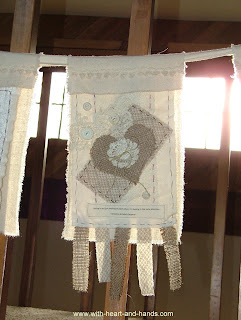 Here, I was creating garlands of prayer flags based completely on the theme of love and at this moment in time, someone was attempting to manifest and project out into the world...the exact opposite. Projecting his own negativity and pain and hurtfulness into a venue that was filled with so much love, so much support, so much joy at the inner strength of the human race to overcome so many personal and physical obstacles. So many good people, coming into Boston and this marathon to finalize their years of hard work and a goals. To work so diligently towards completing that goal..... and then to have it literally...blown away in a couple of horrifying minutes. 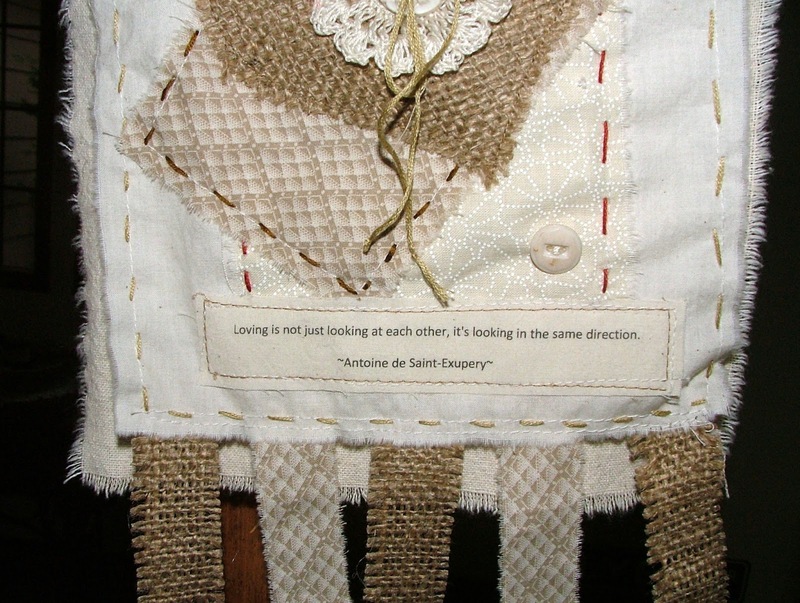 I looked at this little prayer flag that I was making, with its quotation from Antoine de Saint-Exupery, an author best known for his writing of "Le Petit Prince" or "The Little Prince" and its allegorical tale about love. I had printed off this quotation for my little flag and begun to make it in the simplest of fabrics and colors. Muslin and burlap, soft whites, off whites, and beiges. I added vintage crochet pieces and four vintage buttons to tie all of my thoughts and prayers together..to bind all of the layers with love. 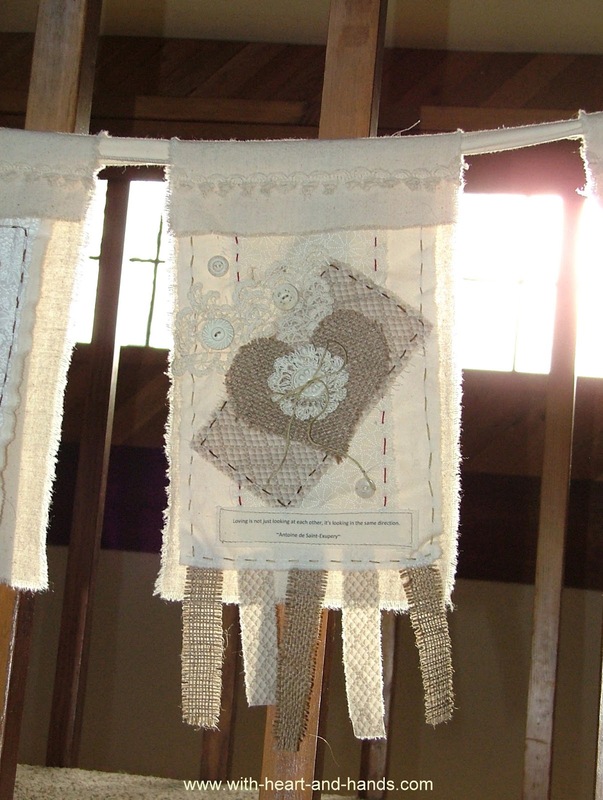 With the addition of random and deliberately uneven utility stitching in the simplest of a 'running' stitch, it seemed to exemplify all of the many layers of emotions that I was feeling as I attached it to my loft railings to spread its love, and its prayers out into the world. I re-read my little quotation ribbon across the bottom. Now, more than ever, it seems to exemplify the power and the strength of the healing energy of love when it focuses on unification, and not separation. When we see ourselves, and our world as all connected, all wanting the same things for one another, the same good things that we want for ourselves. Looking forward and feeling that great love, that great and healing energy that is the opposite of feeling the separation and polarities of our differences. The very opposite of fear, and anger, and hatred. We are all looking in one direction today. We are looking at the city and the people of Boston and all of the Marathon runners, their friends and families, and we are all sending prayers and best wishes of great, and universal love. This is beautiful in every way Michele. Well done, well spoken. A lovely flag and sentiment. Beautiful flag and even more beautiful explanation!